Joanne Mattera, had a vision to “raise the bar” in the area of painting in encaustic and to bring professional artists using encaustic together, first in Beverly, Massachusetts where the first International Encaustic Conference was held, and then to Provincetown, Massachusetts. For 10 years Joanne has invited artists to share their encaustic processes through demonstrations in printmaking and encaustic techniques. The history of artists using encaustic has been shown and the curatorial considerations in galleries have been discussed. These artists, who have been leaders in the area of encaustic, have pushed their paintings, sculptures, mixed media, and art prints out of studios and into galleries all around the world. They have become mentors and teachers to many newbies joining the encaustic communities. Joanne Mattera retired from her position in 2016 and gave the stewardship of the 11th International Encaustic Conference over to Cherie Mittenthal who is the Executive Director at the Truro Centre for the Arts at Castle Hill. She is also an artist who paints in encaustic. She will be the director of future International Encaustic conferences. The 11th International Encaustic was fabulous. I arrived on Wednesday and dropped off one of my paintings at the Adam Peck Gallery and the other painting at the Kobalt Gallery. Then I checked into my room at the Provincetown Inn. Provincetown is beautiful. Walking on the beach and taking a stroll down through the centre of town felt like I was in a lakeside village in Europe. Beautiful architecture and stunning views of the ocean. On the drive down to Provincetown I took a detour to the Cape Cod Museum of Art. Joanne Mattera and Cherie Mittenthal co-curated an exhibition called “Depth Perception.” They selected 18 artists and each focused on spatial layering of the design elements – from the very flat surface treatment with limited depth to building amazing textural surface treatment in a painting or in a sculpture. Then another artist used receding lines to get a sense of depth in the works and another artist used colors as a perceptual element. On Thursday I attended Lisa Pressman‘s workshop and explored painting with oil paint and cold wax. Additionally, we used pigment sticks with the cold wax. This was an experience since I have never used pigment sticks or combined oil paint with cold wax. I did find it very messy and thank goodness I had baby wipes to clean my hands and my painting tools. Painting with oil and cold wax does give a different effect. I loved the class but my passion is with encaustic because I can achieve a quality of transparency by building up many thin layers and/or get sculptural painted lines which I can’t get with any other medium. I enjoyed the gestural qualities of the oil/coldwax medium and working on canvas paper. I hope to incorporate some of the ideas into my paintings. In the evening there was an Art Swap. 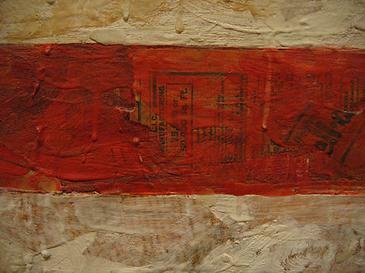 Each artist came with one artwork to donate and wrapped it in brown paper and put the package on a table. Each artist would then get a number and the coordinator Sherrie Posternak would call the number and the winner would then pick an artwork. This was my first time at the art swap and I won a wonderful piece of work by Deborah Winiarski and the winner of my piece was thrilled as you can see in her expression in the photograph below. Early on Friday morning I registered for my demos and workshops. This is a three-day event and packed full of events, such as gallery openings, pre and post conference workshops, demonstrations, art history talks, talks on marketing and ways to promote oneself, how to plan and organize curatorial exhibitions, etc. The quality of workshops are amazing and the beginner as well as the advanced artist can take many ideas back home to their studios. On Friday the conference began. At 9AM the vendor room opened. Of course I had to make a visit the vendor room. I felt like I was in a candy store where the smells, colors and tools were so intoxicating. I did purchase my wax medium pellets and some coloured pigmented wax. I had made an order from Kama Pigments because they live in Montreal and I do buy from them during the year. They really do have good products and great prices. I also bought wax from the other USA vendors because their products are exceptional and the shipping to Canada is prohibitive. After visiting the Vendor room, I attended the first talk by Patricia Miranda who shared her knowledge about “Professional Practice: Strategic Planning for Artists” Patricia began her talk by explaining how each artist has so many jobs in their lives from being a “mini-corporation, entrepreneur, researcher, studio manager, creator, etc.” Time is demanding, she explains, and if an artist does some planning and scheduling of his or her time, then one can achieve personal goals. Patricia talked about creating 5 year plans. Set a goal, research how to get to that goal and then plan to take tiny steps towards achieving your goal. After Patricia Miranda’s talk I attended a demonstration led by Laura Moriarty called “Making, Building, Monotype Prints. She showed us how to make encaustic monotype prints using her discarded sculptural encaustic pieces. She melts these works down by building up her layered design onto a hot plate. Different Asian papers are used for the surface of her designs. The final image looks like a blown-up cross-section of one of her thinly sliced piece of sculptures. After lunch I attended Christine Aaron‘s talk called “Thinking Through Space.” This was an art history session where Christine featured artworks that primarily considered space when exhibiting or installing installations within a gallery. These artists planed the work in relation to where the work would be placed and how scale and lighting impacted their work. Then the last session of the day was with Michelle Belto. This was not a session where we looked at art for inspiration but participated in an exercise to find inspiration from our own history and experiences. As an interactive presentation, we engaged in a meditative drawing exercise and, when the drawings were done, focused on answering Michelle’s questions about our doodles. The questions helped each of us find authenticity and personal meanings. Finally, Michelle explained how that meditative drawing exercise could sustain us in our own studio practice and inform our artworks. In the evening I visited the openings in the galleries. I first attended the opening at the Castle Hill Gallery called “A Sense of Place.” This was a juried exhibition and the juror was Patricia Miranda. She also was the keynote speaker at the conference. I am posting artworks I felt stood out in the show. The paintings from the top left is Steven Cabral, the top right Diana Gonzalez Gandolfi, below is Nancy Natalie, continuing down the second row from the left is Julia Dzikiewicz, second left is Melissa Lackman, and then Dietland Vander Schaaf. The third row from the left is Susan Delgalvis, next along that third row is Stephanie Roberts-Camello (Stephanie won the best in show), then Christine Aaron and Patricia Dunsman. The last line from left to right is Michelle Robinson and Marina Thompson. After the Adam Peck gallery opening, I visited the Kobalt Gallery. On the lower level of the gallery Cherie Mittenthral exhibited amazing artworks. That was the first time I had seen so many of Cherie’s works. She has an affinity with the ocean, sky, plant life, and architectural structures. Her Provincetown environment seems to influence her works. The upper level held the juried exhibition called “Alternative Wax – Layers of Facts.” It was interesting seeing so many different paintings interpret the same theme. I also had a painting in that exhibition. I was exhausted at the end of the day. Came down with a bad cold and got laryngitis. But, that did not stop me from enjoying my day and looking forward to Saturday’s events. In the Next post I will share the second day of the conference and talk about my experiences and the ideas I took home with me.